I watched Office Space again this weekend because I was at a friend’s house and she hadn’t seen it yet. 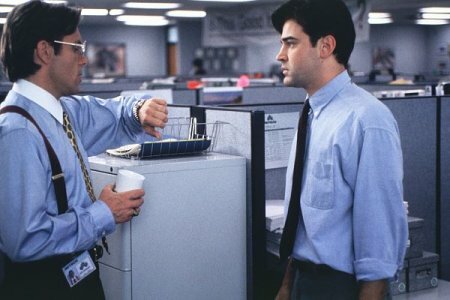 Appalling, I know, but friends help friends out and show them Office Space, which, I’m sure I’ve mentioned many times before, is a superlatively awesome movie. Cult classic type deal. Most people like it because its similar to some grey space they used to work in, familiarity breeds affection or something. My office isn’t really that bad, it’s a good job in a location easy for me to get to, its air conditioned by environmentally friendly means (using the cold water at the bottom of Lake Ontario), nice people (even though usually not as funny as they think they are) and free coffee/hot chocolate. It’s really just not me, not for longer periods of time anyway. My favourite is Milton (in Office Space, or O.S. if you will, tee hee, O.S., that’s my high school). He’s this squirrelly guy with thick glasses and a red Swingline stapler. He keeps mumurring, “I could burn this whole place down… last time I did not get a piece of cake.” The whole movie is laced with gansta type hip-hop rap music (from the mid 90’s) even though its all pasty white nerd people and one brown guy. "I can't believe we're looking up money laundering in a dictionary." Anyway, you probably don’t think its funny, you non O.S. watching person you. I have no use for you then. Good day. Posted by R at 12:07 p.m.
Hypothetically, what if I'm laughing but never watched Office Space? you know, hypothetically. You're the best, Dinah.... but I'm not sure what you mean by the poem with the surprise ending. If we clarify then maybe I can get some more of the verse-y goodness going. i think i know what she's talking about...the poem that sounds like it's about one thing and then actually is about another...i think...come on! it exists! Exactly! and normally I say, show the "blank" poem, but that's the surprise part, and then it's over. It does exist! It's also the one you said on my answering machine.